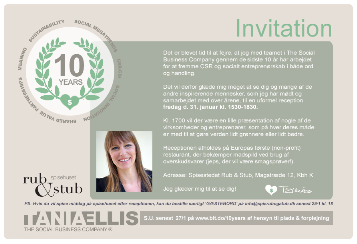 31st January 2014, Tania Ellis and The Social Business Company celebrated their 10 year anniversary of continuous work on putting corporate responsibility, social innovation and entrepreneurship into both words and action. We celebrated our anniversary with a reception for our business partners, clients, and friends of the house. The reception was held at Spisehuset Rub & Stub, Europe’s first non-profit restaurant, which turns wasted food into tasty dinners. All profit is channelled into humanitarian projects around the world. See their amazing international press coverage here. It was a wonderful to celebrate the day with many of the gorgeous New Pioneers, who in each their own way are contributing to making the world greener & better. Feel free to send us an anniversary greeting by writing in our “guest book” (scroll down to the Comments section to write your greeting).